I was nervous about Saturday. Terrified, actually. I was facing 48 hours of alone time with Rob Manna, a daunting feat for even a more experienced, kind, and patient mother than I. So I did what any of you would have done: I over-planned. We dropped Barkley off at PetSmart and were at the gym by 8:30. I ran/walked/made it through four miles and Robbie played nicely by himself for an hour. Then it was off to Jenny Craig for a big weigh-in. Last week, I lost 4.2 pounds (meaning 28 pounds since January and 80 pounds since Robbie was born). Since I hit such a milestone, I decided I needed a change. I felt different and needed to look different. It was time for a new haircut. I wanted to go drastic but wasn’t at all sure the direction that should take… Having worked hard for the last two years to get “long” hair, I didn’t want to go too short. And I have a very definite part, which makes bangs difficult. Thus, the reason I’ve had the same haircut for the past six years… But, after much discussion, we took off an inch-and-a-half, cleaned up and shortened the layers, and cut some sweeping bangs. I have to be honest; I looked fabulous! Just like the new person I felt like inside. It feels nice to finally match how I feel. After a brief nap, Robbie and I hit the road for a, well, road trip. 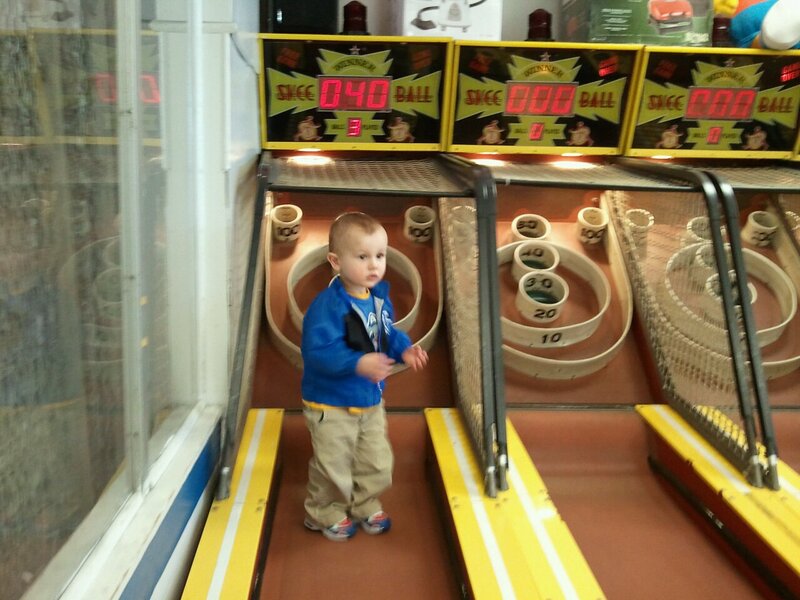 We headed up to Salisbury Beach to the arcade on the boardwalk. A friend of mine works there, and she suggested I bring Roberto up for a little while when I mentioned my apprehension about our weekend alone. She tossed me a roll of quarters and told me to have fun. Robbie just stood there, in awe of the big kids, flashing lights, and ringing bells. And then he was off! Running around like a madman, throwing balls, hitting buttons. He rode the bulldozer and took his turn at the merry-go-round. He straddled a motorcycle and tried to drive fast cars. Robbie bopped ‘gators on the head and tried to feed Big Bertha. He shot some basketballs and had nice people give him their tickets. And he left with not one but two balls. We made it home in time to pick Barkley up from PetSmart, make a batch of cookie dough, and toss Rob into the tub before heading out to watch the Kentucky game (well, I guess it turned into the UConn game, but whatever). Part of what I really like about Robbie growing up is that he’s a great partner-in-crime. He has a great sense of humor and likes to have a good time. He’ll laugh for a good five minutes and dance his head off and not care that anyone’s watching. 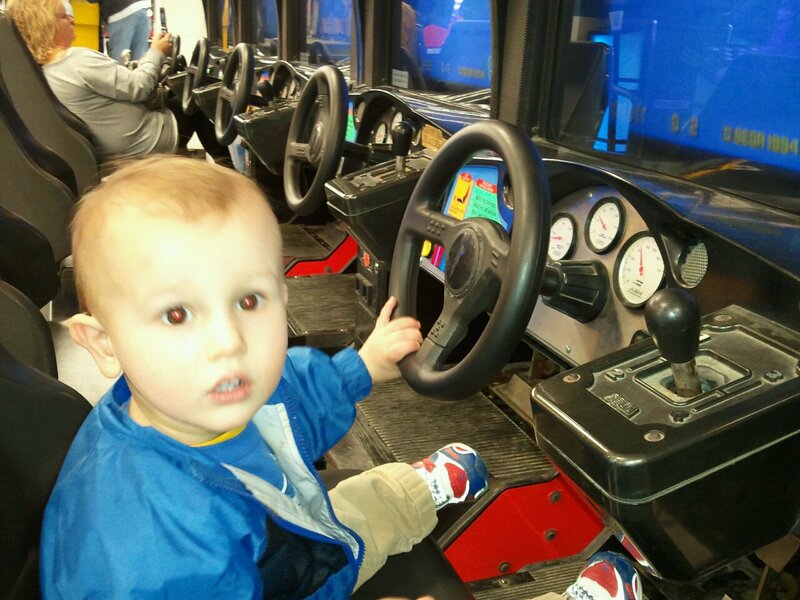 If anything, this Saturday, I learned that I need to live my life a little more like my son. And that’s a lesson I definitely needed to learn.